Centrifugal, or rotary, feeders are not typically known for their ability withstand heavy, hard, or sharp parts. Rotary style feeders generally thrive with light-weight plastic parts that would deform before causing damage to the feeder system. Of course, a part is not automatically considered suitable for a vibratory feeder just because the part will not work in a centrifugal feeder. After years of observation, we began to notice a whole family of parts that seemed appropriate for automated feeding systems but would not work properly in traditional vibratory or centrifugal feeders. 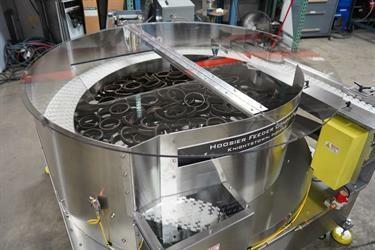 It is for reasons like these that Hoosier is very excited to introduce our Heavy Duty Centrifugal Feeder. Our Heavy Duty Feeder platform is based closely on a standard centrifugal feeder system with a few key variations. Discharge conveyor replaces the typical “tub” reaching into the bowl, following the inner circumference. It receives parts from the horizontal disk and elevates them from the rest of the parts and to the desired discharge height. One excellent advantage of the HFC Heavy Duty Centrifugal Feeder is it’s ability to handle heavy parts. Where most centrifugal feeders use ABS disks with no structural support, our HD feeder relies on stainless steel and 6 roller supports near the outer edges of the disc to ensure heavy metal and dense parts smoothly travel through the system. Additionally, the HD feeder can easily be tooled to feed multiple parts of the same family, and can even be outfitted to change tooling automatically. When centrifugal and vibratory feeder systems can’t perform under the weight of your application, we turn our eyes toward Hoosier’s new Heavy Duty Feeder. If you want to know more benefits of the new Hoosier Feeder Company Heavy Duty Centrifugal feeder, or are curious about how it can contribute to your next project, reach out today!